Technology is a freight train - so the way I see it, we have two options: stand in front of it or jump on it. I’ve jumped on. Growing up, I loved to read books about the past. I often found myself wishing I was part of the Industrial Revolution, or the first caveperson to strike fire; that I had painted the Sistine Chapel, or been part of the team that built the first computing system. I have spent my lifetime searching for what will shape our next few generations. I dug deep into education, politics, and non-profits, making some cool innovative change along the way, but not at the breadth or scale that people deserve. This is not due to lack of passionate efforts by myself and my colleagues; rather there was something missing. I started to reflect over three years ago to try and find common threads amongst the shortfall of progress in all the industries I had worked in and it became rather simple - we need to build trust, and words are cheap - actions speak. As simple and as difficult as that. While in public service, I constantly grappled with fact-checking,. or being able to consistently trust the word of others. How do we know if an event really happened? How do we know that only a certain amount of a product or service is available? Who and what are verifying these things? The answer was always one-sided. It was someone in a position of power - not the people who might utilize that fact or need that product. This realization is why we have now created an entity and embraced a technology that is here to bring more power and trust to the people who deserve it. After working tirelessly to launch one of the first live Blockchain technology companies in the five boroughs of NYC, I joined Human Ventures as a Venture Partner to help founders navigate the turbulent waters of regulations and politics, having experience in both the public and private sector. Both experiences made clear that the promise of Blockchain technology is reliant on the right mix of structure and founders. If done right it could build the next generation of trust. 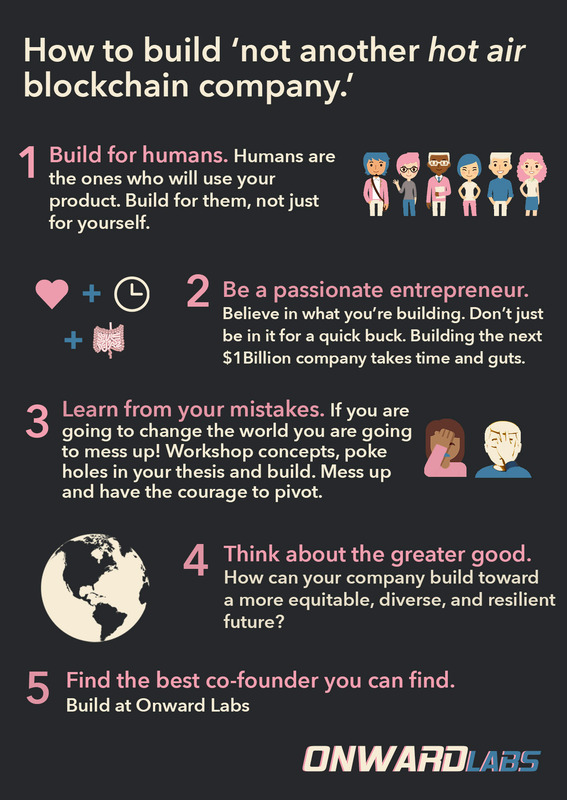 In my opinion, it is easy to find a market opportunity - it is difficult to find the right humans to lead it up. It takes guts to be Human. Although this has always been true, we feel it more than ever in these rapidly changing times. With words and phrases like hack, fake news, and decentralization becoming norms, it is easy to lose sight of what we can hold on to as a true community. The good news is the conditions that have led us to these happenings were human-made, which means that diverse and thoughtful humans can and will solve them! And that is why we are launching Onward Labs with Human Ventures as our Co-Founder - to create an outlet for us all to plug in - company building, investing, and tech for a brighter future. At Onward Labs we cut through all the noise (B.S.) and build adaptable and socially conscious solutions for real people, like you, and like us, that just so happen to use Blockchain technology. Our mission is to build companies that spur civic engagement and lead to a more equitable, diverse and resilient future. "I’ve heard people compare knowledge of a topic to a tree. If you don’t fully get it, it’s like a tree in your head with no trunk—and without a trunk, when you learn something new about the topic—a new branch or leaf of the tree—there’s nothing for it to hang onto, so it just falls away. By clearing out fog all the way to the bottom, I build a tree trunk in my head, and from then on, all new information can hold on, which makes that topic forever more interesting and productive to learn about. And what I usually find is that so many of the topics I’ve pegged as “boring” in my head are actually just foggy to me—like watching episode 17 of a great show, which would be boring if you didn’t have the tree trunk of the back story and characters in place." Our role at Onward Labs is to ensure we start with the pilot episode. Just ask Elon about the foundation of knowledge it took to get a rocket into space not just post an emoji of one doing so. So technology is a freight train - it’s inevitably going to impact our lives. At times in my journey I have heard people say that everyone loves change, as long as everything remains exactly the same. My read on that is not one of cynicism, rather that it is the public saying, “Bring us solutions that seamlessly fit into our daily lives!” And these solutions are contingent on a relationship of trust. 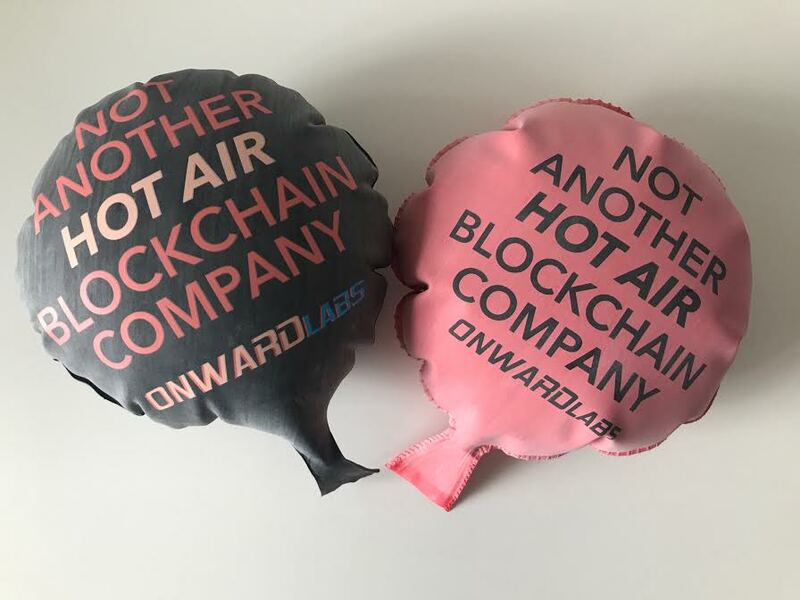 We at Onward Labs say challenge accepted, and welcome to Onward Labs - not just another hot air Blockchain company. - Onward.